Which breakfast goes best with coffee? Perhaps the king of breakfasts...coffee with eggs and ham. I can’t imagine breakfast without coffee. For me, it’s not about choosing a coffee to go with my breakfast. It’s about choosing a breakfast to go with my coffee. 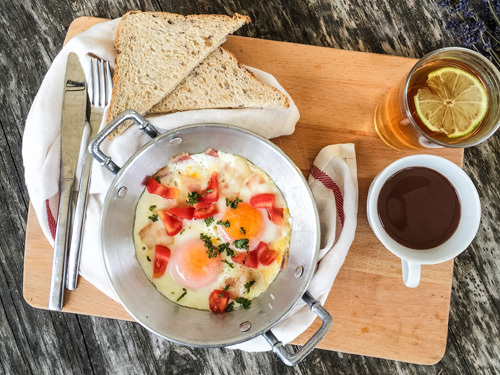 Maybe you are an eggs and bacon person, with a steaming mug of coffee on the side. Or perhaps you prefer a bagel with your coffee. Or fruit. The point is, for most coffee lovers, a mug of coffee is central to any breakfast. Doesn’t matter whether you are eating at home, having breakfast in the car on your commute to work, or sitting in a local diner or café. Actually, for a clear idea of the role coffee has with breakfast, just drop by that diner or café. What’s the first thing they do after handing you the menu? They pour you a mug of coffee. So there you are, coffee in hand. Now what comes next? What do you “pair” with your coffee? 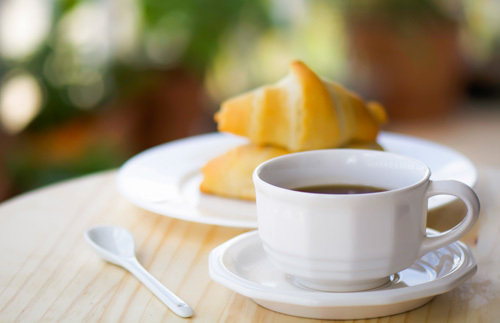 A nice light breakfast - a small coffee with croissant. If you’re in a fancy hotel, you’ll have no end of choices. Fruit, muesli, bacon and eggs or some fresh pastries. And so on. But putting aside special occasions or a social breakfast with friends, what’s your own personal favorite? For a few years, when I was commuting to work, I was a coffee and bagel guy. But I think that was principally because a bagel is easy to eat in a car or at your desk. And when staying at hotels I often buy a coffee and a muffin for breakfast. Again, muffins are easy to take back to your room and enjoy without making too much mess. I have even been known to have a plate of fruit with my coffee, usually while on vacation in a hot country. But in my heart of hearts, I like my breakfast coffee best with a plate of bacon and eggs. And toast. And some beans on the side. Total comfort food. And absolutely incomplete without a strong mug of coffee. Of course, when traveling abroad, you can expect all kinds of exotic choices when ordering breakfast with your coffee...like this meal from Algeria. 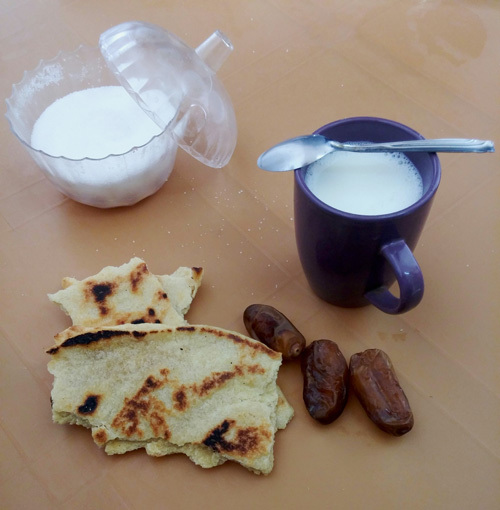 Breakfast in Algeria, with flat bread, dates and a very milky coffee. How about you? What do you like with your coffee at breakfast? Just click the button next to your choice below, then click the button at the end of the list...and you’re done. And once you have made your choice you’ll get to see what everyone else has selected as their favorite breakfast. 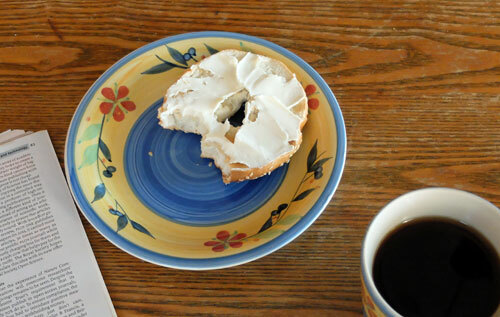 A simple at-home breakfast - a bagel with your coffee.